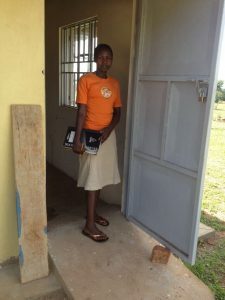 It’s been a long awaited dream at Teams4U to have a Vocational Training Centre in Kumi, Uganda! For a long-time this felt like pie in the sky as the capital to start such a large project seemed impossible to raise. But we are absolutely delighted¬†to let everyone know we’ve opened our first module of the school this year! In February our first class started with 30 students (out of 120 applications) enrolled on a 2yr Tailoring course. Previously, anyone in the Kumi region¬†had to travel a minimum of 30 miles to the nearest Vocational school in Soroti. This is an¬†unimaginable distance for most Ugandans! Some of our students are cycling 10 miles to get to our school and many have to get up at 5am to make class for an 8am start. We now have 28 young women and 2 young men under the tutelage of Sewing¬†Instructor Eunice, with the hope that the skills they learn will enable them to set up their own business¬†enterprises when they graduate. As part of class they are also instructed in numeracy, literacy and business management and, in the second year of their training, will be expected to make clothing to sell to self-fund the school. Each of our students requires a professional sewing kit (costing ¬£20), including a tape measure, dressmaking pins, scissors, sewing needles, threads, tailors chalk, rulers and elastics. Would you please consider supporting one student with the materials to succeed in their course? 25yr old Mary was one of the successful applicants for¬†our tailoring course. She dropped out of school in the first term of Senior 4 (Yr 11) to get married and now has three children. Her husband is an unpaid apprentice welder in Soroti and is not able to return home often or support the family. Even though Mary has 8 brothers and sisters she’s relying on her mum to pay her school fees. She knew she had to find a way to maintain¬†herself and her family so this opportunity to learn a trade has meant the world to her. This is her opportunity to secure her future! Our first classroom cost ¬£10,000 to build. The next stage for us is¬†to raise the capital to build a further classroom to teach Joinery and Masonry. We don’t want people to have to leave their families and their homes (virtually impossible for young women) to travel the distance to Soroti to learn a trade.¬†Currently only 1 in 7 are in regular employment in the Kumi region! Over time we would like to build a school that¬†seriously challenges these statistics¬†and provides the young adults in Kumi with the¬†opportunity for financial prosperity and security. Our classroom needs textbooks, tailors mannequins and charcoal irons (for heating over a fire).